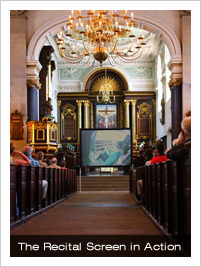 Our weekly series of summer organ recitals – Lunchtime Live! – begins on Thursday 14 June at 1:10pm. This year features seven players in six recitals, each one featuring The Art of Improvisation. The idea for the series was formed as the Choirs of Boys, Girls and Men toured Paris last year, giving the first performance of David Briggs’ Messe pour Saint-Sulpice in that great Church. At the Mass last year’s series patron Daniel Roth invited Mr Briggs to improvise at the Mass – a great honour – and the choirs had the delight of hearing the artistry of his improvised Fugue 'Tutti Flutti', Offertoire and Sortie. 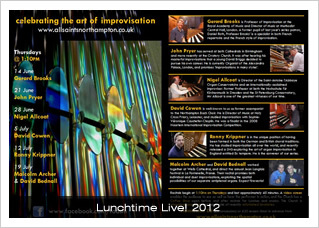 Ronny Krippner, tutor in organ improvisation at Birmingham Conservatoire was invited to convene the series, and he has brought together some of the finest improvisers living and working in Britain today. Sadly, Mr Briggs was unavailable for the summer, having recently taken up the position of Artist in Residence at St James’ Cathedral, Toronto, Canada, a fine Cathedral where our own choirs sang in 2008. Cauchefer-Choplin. On 12 July series convenor Ronny Krippner performs in his inimitable style – his Handelian improvisations are truly amazing, and the series finishes with a bang with Malcolm Archer and David Bednall (19 July). This final recital features two organist-composers who have been commissioned to write choral works for our choirs (Archer O where can I go from your spirit (2002), Missa Omnes Sancti (2004), O sing unto the Lord and new song (2012); Bednall Psalm 150 (2007) and St Matthew Passion (2009)), and who have a long working relationship. Their recital will feature solo works and solo improvisations, as well as duet improvisations exploiting the antiphonal Gallery and Chancel Organs at All Saints. Bistro providing drinks, snacks and meals before and after the recital, as well as easy access and lavatories. We are delighted that the series has been chosen as Choir & Organ’s featured recital series of the summer. This is the second time in recent years that our trailblazing programming has been recognised in this way. In 2010 our series featuring women organists’ 'The Queen of Instruments' was chosen; we are delighted that St Paul’s Cathedral have followed in our footsteps with their summer recital this year – 'The Queen of Instruments'! We encourage you to buy a £20 ticket at the first recital on 14 June, which provides entry to all six recitals, or else tickets are available separately for £6 (£4 concessions) for each concert.